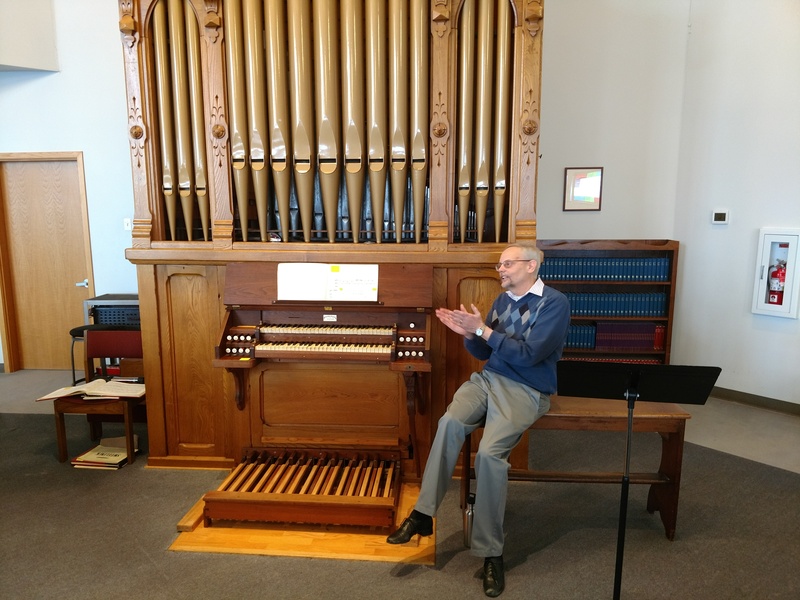 “The 1820’s were good years to become an organ builder in the United States.” So explains Tim Drewes, who, along with Cheryl Drewes, presented our January 2018 program at St. Matthew-San Matteo Episcopal Church in Auburn, Washington. In the 1820’s, the country was growing, expanding westward, and becoming home to many Western European immigrants who were accustomed to having organs in their churches. In addition, the tenor of religion in the Northeast, previously largely Calvinist, was becoming more diverse and more open to using organs in church services. 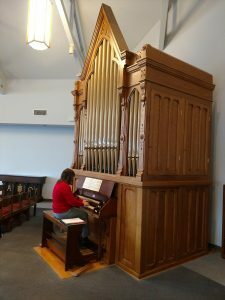 In about that same year, the Hook and Hastings company produced Opus 591, a 10-stop 2-manual organ, for Chestnut Hill Presbyterian Church in Philadelphia. Tim Drewes points out that it was common for small organs to move from church to church, often many times. Opus 591 moved from Philadelphia to Camden, New Jersey, then to Auburn, Washington in 1999. One of the oldest organs in Washington, it is largely unchanged. It was restored by Patrick J. Murphy and Associates prior to its move to Washington, at which time the oboe, having been removed, was replaced with a similar one. The pitch was lowered from A450 to A440. There may have been one additional modification prior to its 1999 move. The organ has a “hitch-down” swell–a lever to control the swell shades rather than a balanced swell pedal in common use now. This swell arrangement is similar to that used by César Franck on the Cavaillé-Coll organ at St. Clotilde, Paris. The swell lever can be hard to reach while playing, and this organ has an extra piece of wood attached–which, according to Tim Drewes, looks suspiciously like a dining room table leg. Providing musical examples to demonstrate the various tone colors available for $1500, Cheryl Drewes began with the first movement of Mendelssohn’s Sonata in F Minor. This magnificent piece uses the Great and Swell divisions in dialog, features the oboe, and filled the church with its robust sound. Proceeding to two pieces meant to showcase “the flutes to die for,” Cheryl played a Sweelinck echo fantasy and Bach Pastorale in F Major, pointing out that the organ made her feel as if she were playing an actual flute–surely a hallmark of a well designed instrument. Perhaps to demonstrate the flexibility of the organ, and definitely demonstrating the flexibility of the organist, Cheryl Drewes ended her musical examples with her own theater-organ style transcription of Cole Porter’s “Another Op’nin’ Another Show,” made famous in the 1948 musical Kiss Me Kate. Her transcription included a little surprise–a quote from César Franck’s “Pièce Héroïque”. 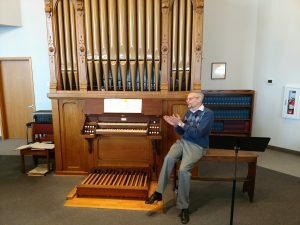 Tim Drewes continued the demonstration, pointing out that the organ has quirks that one has to consider when choosing and performing literature. There are cost saving measures–for example, the oboe doesn’t include the lowest octave. The pedalboard is only 25 notes–enough to play most pieces, but still holding the possibility of a surprise if the organist is not expecting to run out of pedal. The layout of the keyboard is a little odd. Possibly cost saving, or possibly as a way of making organs narrower, the keys are smaller and closer together than normal. This innovation didn’t last long, as organists didn’t like getting their fingers stuck between black notes. The Auburn organ has knobs facing the player that adjust the key depth. Most organs have such a feature, but accessible only from within the case. Offered as an innovation in the 1860’s, the purpose was to be able to adjust for key depths that changed because of cold or dry buildings. The feature was not popular and subsequently removed. Tim Drewes speculates that those particular knobs might have been tempting to 1860 children who came up after church to see the organ. Tim Drewes continued the musical examples with “Response” by George Whitefield Chadwick, a major American composer of the late 19th century. The piece was chosen to demonstrate the organ’s flutes and strings, individually and in combination with each other. Continuing with Franck’s Pastorale, Tim began with oboe alone, and changed stops many times to demonstrate the organ’s colorful possibilities. Using only the diapason and 4-foot octave, Tim Drewes ended the program with Bach’s 9/8 C Major Prelude. The sound was clear and distinct, filling the room and proving that it was capable of rendering Bach in addition to the Romantic literature for which it was designed. 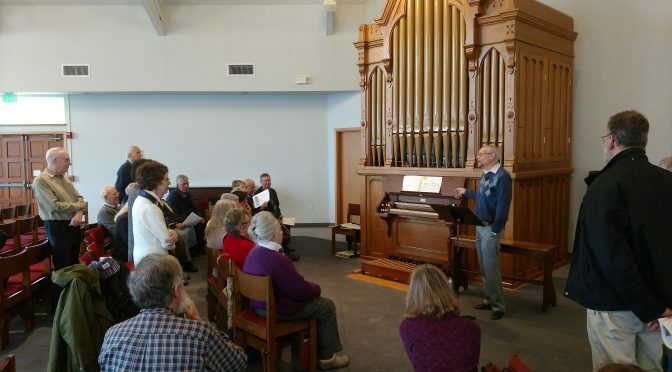 Many thanks to Cheryl and Tim Drewes for an extraordinary program showcasing one of the historical gems of the Pacific Northwest, and giving us a glimpse into the history of an important American organ builder. Thanks also to David Dahl for program guidance, to Una Hwang, our program chair, to Karen Bredberg for providing refreshments, and to Father Antonio Illas and St. Matthew-San Mateo Episcopal Church for hosting the meeting. The handout provided at the meeting is attached as a PDF file. it includes the list of musical examples, portraits, a drawing of the Hook factory, and additional historical information. Special thanks to Tim and Cheryl for a wonderful presentation! It was outstanding in every way. And thank you for this fine article.